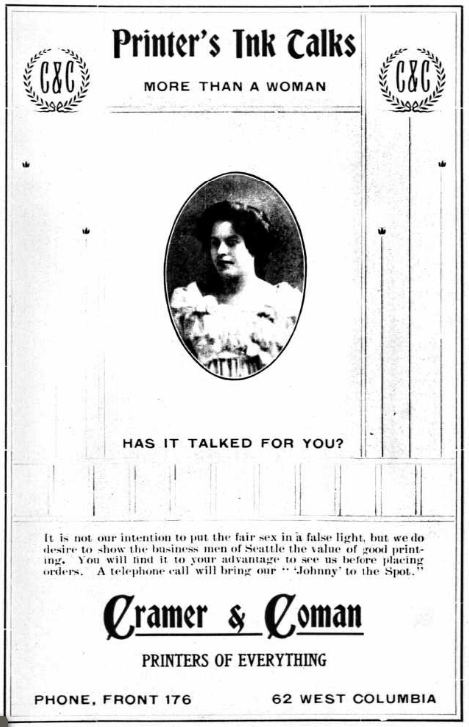 Ad in a Seattle city directory, 1902. I think some of these may be the same cat. The breeder who can breed actual pink kittens would probably make a fortune. You know it’s true. 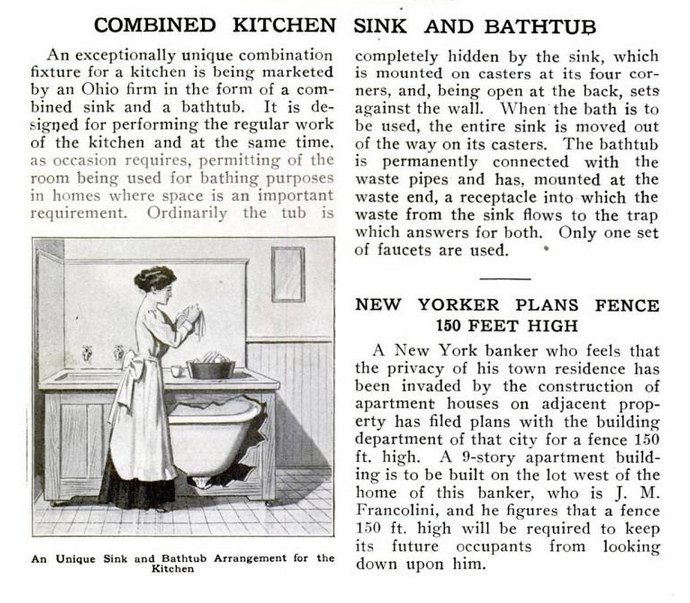 Popular Mechanics, November 1911 issue. YEAH! Magazine was published off and on in 1987-88. I founded the magazine during the summer of 1987, after a long conversation with friends at the Hall of Fame club in Seattle’s U District. I had just gotten back from touring with Prudence Dredge as a vocalist, and a few of us were bemoaning the state of local music-oriented media. The Rocket, where I had been writing for a couple of years, was good, but only came out monthly, and included a lot of national and international acts, not just local bands. That year, an issue of The Rocket had Bruce Springsteen ocn the cover, and some of the locals were not pleased. Springsteen didn’t need the press, they felt. Why not feature the local talent? The Rocket was great for what it was, but a lot of people felt the need for more. There was so much talent in the Seattle area, and so much going on. So I figured there was room for a “local music supplement,” as it were. Something that would come out every week and list all the upcoming shows in the area, and write exclusively about local bands. Let The Rocket have Springsteen and U2—we’d write about the Squirrels and the Fastbacks. One of the bands I was peripherally in at the time (Prudence Dredge) was on Green Monkey Records. 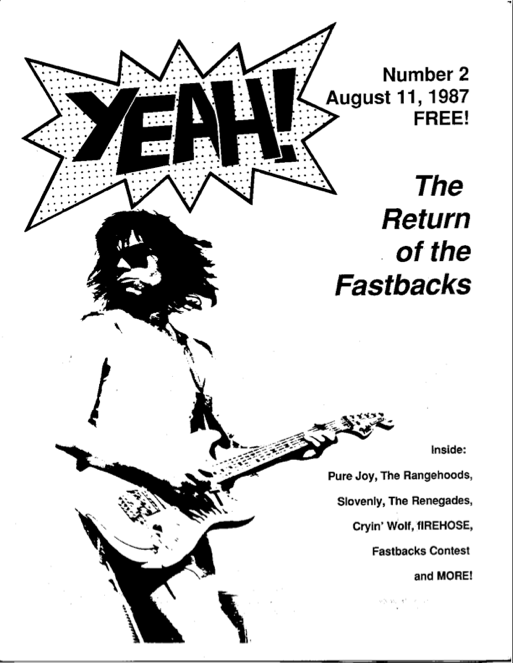 Other bands I saw a lot at the time, such as the Young Fresh Fellows or the Fastbacks, were on Popllama. The Popllama/Green Monkey groups tended to have a common fan base, and most of the volunteers I was able to scrape up for YEAH! were friends or fans of those bands, so we tended to have an (unhealthy, probably) emphasis on that aspect of the Seattle scene. There was a lot happening elsewhere, and perhaps if I’d kept publishing longer I would have improved the ‘zine by covering the rest of the scene a bit more. But it was difficult to do when I was relying so strongly on friends/fans of the bands I knew well, and my own limited experience. 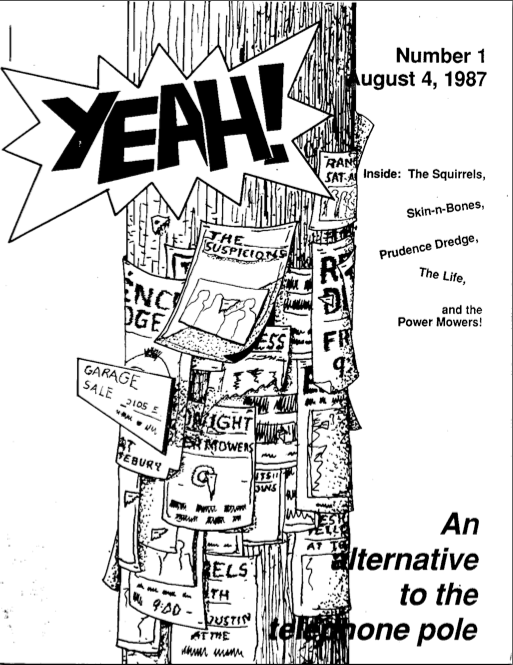 Later that year Dawn Anderson’s Backlash started publishing, and it covered the Sub Pop groups and other stuff that YEAH! wasn’t doing a great job of covering. We introduced YEAH! to local music fans by showing up at one of KJET’s Mural Amphitheater shows and distributing as many of them as we could. (I think we only had 250-500 copies of the first issue.) It was fairly well-received. The next week, we did it again, and people were actually waiting for us to show up. It seemed as if we were a success, but then again, the magazine was free. I continued publishing YEAH! through the fall and early winter that year. We did manage to keep up the weekly schedule for a while, but it was grueling, and no one—including me—was getting paid. Ad sales were eventually enough to pay for printing, and nothing else. 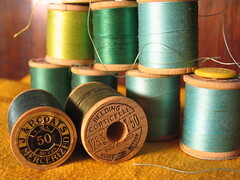 (The early issues were mostly printed for free or cheaply via several kind benefactors. The first issue was printed secretly overnight on a heavy-duty photocopier at someone’s workplace. A few more were printed by someone with access to an offset press, for a small fee. Later we went to an actual printer in Snohomish and printed on newsprint like a real newspaper. But the cost was high.) I couldn’t manage the weekly issues anymore, and had to print less frequently. I think my day job that fall was occasional temping or part-time work. I don’t remember for certain. I think I was barely surviving, and it was stressful. Along with the logistical difficulties of publishing came the problems of publishing a ‘zine about your friends. I should have expected what happened, but I did not. Feelings got hurt, people started to fight, and eventually I decided I had had enough. I packed up my stuff and made plans to move to Minneapolis. I moved to Minnesota in early 1988. Before I moved, I sold YEAH! to Holly Homan and Joe Davenport for $300. I still contributed occasionally after that, but I was no longer the editor. I came back to Seattle six months later (long but not very interesting story), and soon ended up writing for Backlash. Recently I was looking through my collection of YEAH! issues, and I thought it would be nice to get them scanned and online for people to enjoy and reminisce over. The first two issues are here, and I will try to get the rest of the issues from my tenure as editor posted soon. Perhaps I will post them on the anniversaries of their original publishing dates. I am glad I published YEAH! I learned a lot and had a lot of fun doing it. It did cause a lot of upheaval in my life—much more than I’ve gone into in this brief post. Much of that time was very difficult and stressful. But the net result was positive. I hope you enjoy this glimpse into Seattle in the late ’80s. It’s been a while now, but I remember quite a few late night meals at the Dog House before it closed. It’s hard to believe it’s been 16 years! So when I saw this matchbook cover on Flickr, it made me smile. 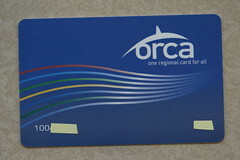 This ORCA card needs a sleeve. Photo by Atomic Taco. I haven’t been posting much lately — been busy working on the Beacon Hill Blog and other stuff, but one thing I have done a bunch of is riding our new Link light rail trains and using my new ORCA card to pay the fare. I was used to a similar card from our trip to England last year, where we used Oyster cards to pay fares for the Tube. Oyster cards, as it turns out, are exactly the same size and shape as ORCA cards. And as with Oyster, you might find a need for a storage sleeve for your ORCA card. Sure, you can just put it in your wallet with your credit cards, and, depending on the wallet, sometimes you can even tap the card in without removing it. But then there are times when you have to show your ORCA to a fare inspector, or remove it to get it to tap, and it becomes necessary to keep your ORCA in something easily accessible and quick to find in a crowded purse or backpack, while also protecting the card from damage and wear. No one wants to be late for work and then find out that their ORCA won’t work because it’s bent and worn out from being tossed around a purse with your keys and stuff all the time. In London, where they’ve used Oyster for several years now, Oyster card sleeves are a booming business. When you get your Oyster card, it comes with a plastic folding sleeve. Our Oyster sleeves last September were bright yellow, sponsored by IKEA, with an IKEA logo, and listing the four London-area IKEAs along with instructions of how to get there by transit — convenient! (This seems like a good way for ORCA to generate some advertising cash without selling advertising on the cards themselves: get local business to sponsor the sleeves.) Other businesses have sponsored giveaway Oyster sleeves. I particularly like this one from The Guardian newspaper and this one from skilljuice.com. Along with the giveaway Oyster cases, however, you can buy tons of stylish or unusual Oyster sleeves from a variety of vendors, or even knit your own. You can get an Oyster case to suit just about any aesthetic or interest, and some even have added functionality — the London Transport Museum, for example, sells an Oyster sleeve with a map of the London Underground Network. The British Library has sleeves with the art of Olga Hirsch, and Tate Modern features the art of Orla Kiely. A search for “oyster card” on Etsy brings up a bunch of handmade, artsy card cases. Since Oyster card holders are the right size for ORCA cards, if you want your ORCA to be kept stylishly in a London Underground map Oyster sleeve, no problem. Perhaps eventually we’ll have some interesting local ORCA sleeves to choose from, but in the meantime, many of the UK sellers do ship them here. If you find an Oyster sleeve that expresses your personality, go for it. Or you can just keep it, along with all of your money and random stuff, in an old plastic card case like this. This morning, in London, 150 copies of a rather unusual newspaper were distributed to commuters. The Manual is “the first hand-made newspaper in the UK”–a four page paper, entirely drawn and written by hand, then silk-screened in a numbered, limited edition. The intent, say the publishers, is to “show that handmade qualities can transform newspapers from ‘junk’ to collectable,” and to demonstrate the power and value of the tactile qualities of ink and paper. They hope to find sponsorship to continue to publish, but if not, they say they’ve enjoyed it as a one-time experience. It sounds wonderful, and I wish I could see the complete paper. Hi all. I’m back. I took the summer off, and a well-needed break it was. I upgraded WordPress while I was offline, and it’s doing some weird stuff. My categories are gone and it’s ignoring some of my formatting. But I guess I’ll ignore it for now. 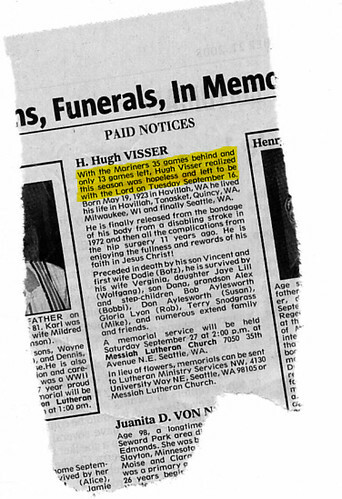 I’ll restart the blogging with a tidbit I noticed in last Sunday’s Seattle Times obituary section. Photo by Audin, Creative Commons. Jason, in his new vehicle. He looks way too happy. 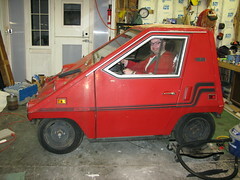 It’s a Comuta-Car (here’s another one), an electric car from 1979 or so. He and Audin both bought Comuta-Cars today. They aren’t running at the moment. 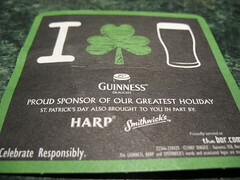 It’s that day again; yes, the day when all Irish pubs are jam-packed full of people and you can’t hear yourself think. On St. Pat’s, I recommend going to a Mexican place. It will be dead quiet. Cinco de Mayo — now that’s the day to visit the Irish pubs. 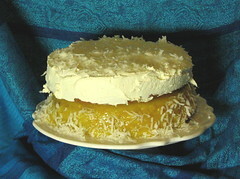 If you decide to stay in, how about a couple of Irish recipes from the always great gumbopages.com website? Stew with Lamb and Guinness and Scallion Champ oughta do the trick. I just stumbled on Pee-Wee Herman and the Alien Invasion, a very short super-8 film shot by an 8 year old (back in the 80s, I assume). Pretty well done, considering. The claymation part works nicely. It’s not all that exciting, I guess, but it made me smile anyway. You can compare it to Pee Wee’s Brain, which was an actual clip from Pee Wee’s Playhouse, also with claymation. Today marks the 17th birthday of Slumberland BBS, the bulletin board system I started in 1991. Slumberland is a Citadel board; that is, it runs one of the many kinds of Citadel BBS software. There was a time when the Seattle area had tons of Citadels. Mine is probably the last one standing. Up until only a few years ago, you could still dial in to it, using a modem and a voice line, but now it’s telnet only (if necessary, though, you can get there from a java applet on a web page. When the BBS went up in March 1991, it was running MacCitadel software on a MacPlus. MacCitadel was OK, but it had some quirks (the kind of quirks that could eat your whole message base), and it could not network with the other Seattle Citadels. Which was important at the time, since most of us had no Internet access, so we used Citadel networking to send our messages across long distances. (As far as Texas and New York, which was pretty impressive at the time.) So I picked up a used 286 from my employer and started running TwitCit in July 1991. Later I switched to GremCit and eventually Citadel+, which is what the board runs today. Slumberland, like most Cits, is a “message board”; it didn’t exist for games or file downloads, but for conversation. (Though we did have the odd file here and there.) We still post messages in the various “message rooms” (topic areas), and the software now also has live chat support, so many of us just hang out at Slumberland all day long, chatting when we can. I wonder what I would have thought if, in March 1991, someone told me that Slumberland would be up and running 17 years later, and it would be the last survivor of the old Seattle Citadel network.